UGH. He’s dumping more of his Yearlings, Orphan Foals and Mare/Foal Pairs in the Killpen. LET’S HELP SAVE THEM. Three days ago I wrote about how the HORSE AND MAN group collected enough money to feed yearlings in a killpen which then garnered enough time for the diligent ’round the clock workerbees to find all 33 of them homes! It was incredible and everyone was thrilled that all of these babies (and a few mares) found new homes. 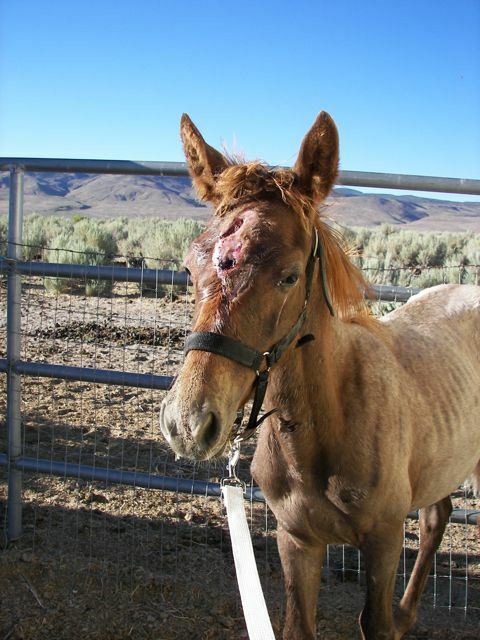 This poor orphaned filly bashed her head when her Momma was taken away and put on the truck. Debra pulled her and had her treated by the vet. Her name is Lucy and she needs a home. Debra (the woman spearheading these rescues) is just a regular person like you and me. She heard about this horrible breeder dumping all of his mares/babies and she was outraged. So, she took it upon herself to negotiate with the feedlot for time on the small (less fat) ones. And, she’s running herself ragged trying to save them all. Not easy. But she’s doing it. So far, she has placed 36 horses in just over a week! Unbelievable. Many of them she is temporarily housing at her ranch. I’m sure she will run out of friends, workers and helpers in time – but she still has the fire to finish the job. Bless her! TODAY’S LOAD IS 9 YEARLINGS, 3 NURSING MARES with foals AND 3 ORPHANED FOALS. 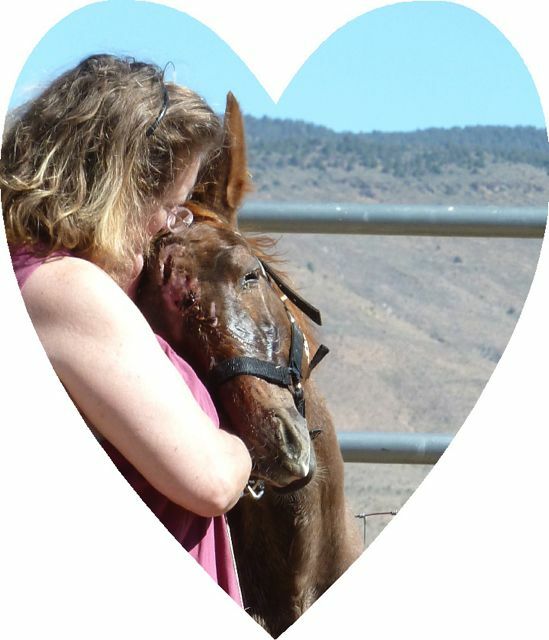 Right now, Debra is reporting 9 yearlings, 3 orphaned foals (their moms shipped) and 3 nursing mare pairs were just put into the killpen by the same guy. Ugh. All are in good weight and nicely conformed. He was an irresponsible breeder but he had a good eye, they say. Here are some of the yearlings. They are nicely conformed, I'm told. Can anyone provide a home? Click to see the larger images and brief descriptions. She hopes to save them. She just needs time and solid offers of temporary or forever homes. The least we can do is help her feed the ones she has saved that are now on lay-over at her ranch. Also, we can help with their vet bills and hopefully help her bail a few more if/when homes open up. If the money is ready, she can grab at the opportunities as they arise. You can Follow her progress on Facebook. She puts updates under their photos. You can see all the photos and offer a home or layover, if you can! OMG. These faces... We can make a difference. I say, for the rest of the month, let’s help her with the easy part – funds. Let’s tell her that the August Bucket Fund is hers to feed the transitioning horses and to hopefully get the mares and babies homes. Debra has already placed 35 of these doomed horses in just over a week! She can do it again. LET’S HELP! $3 is a Starbucks or it could feed a yearling or mare/foal for a day! A drop in the bucket may easily save a life. THANK YOU ALL!!! PLEASE FORWARD AND SHARE!! To watch the donation thermometer rise, click here. 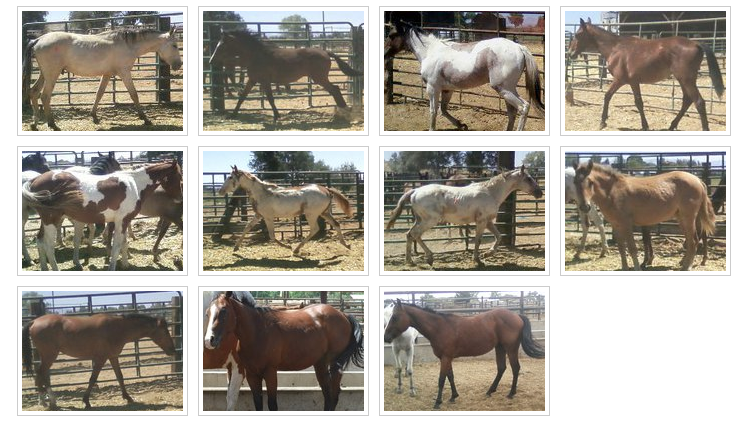 Some of the newly rescued foals temporarily housed at Debra's ranch. We have helped and are helping to feed these beautiful babies. Thank you! ARRRGH! There are 33 MORE yearlings and 2 year-olds in the KILLPEN! If we help with their food, we can buy some time. AUGUST BUCKET FUND – The Yearlings..
WILL WE DO IT? YES WE CAN! The Bucket Fund YEARLINGS and NURSING MARES have one more day and that is TODAY! 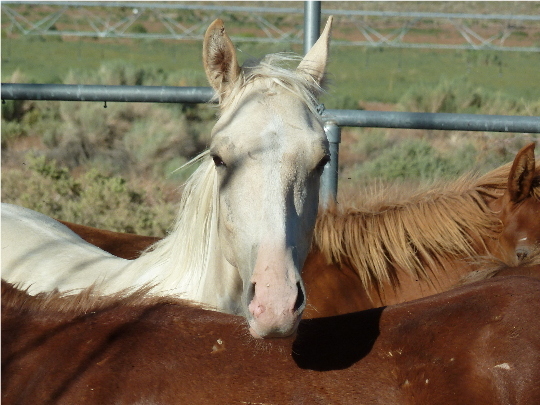 Please feel free to post any at-risk horses you hear of who are available for placement here. The team is very good at placing horses in great homes. Thank you, EVERYONE, who’s contributed! It’s so great to see people pitching in to help. It takes many to make this happen and there are many of you! Let’s held the breeder! He’s a scourge! That breeder needs to be on restriction. Can we sneak in and geld all the stallions?